I had the opportunity of attending the Absa Woza Nazo Kick-For-A-Million financial advise session at the George Lea Park, Parkmore. The Woza Nazo event was an opportunity for the ten finalists to be given advice on how they can invest their R1-million should they win the competition taking place on the 12 May 2018. There was a lot of advice from the former footballer, commonly known as Ngwana Wa Tshwenya, Jabu Mahlungu. When all ten where asked what did they do with the R5000 they already from their different regions, only one man stood up. He shared that he bought his wife a stove and bought himself new soccer boots. I wondered if married men were able to manage their money better than single guys because of responsibilities. 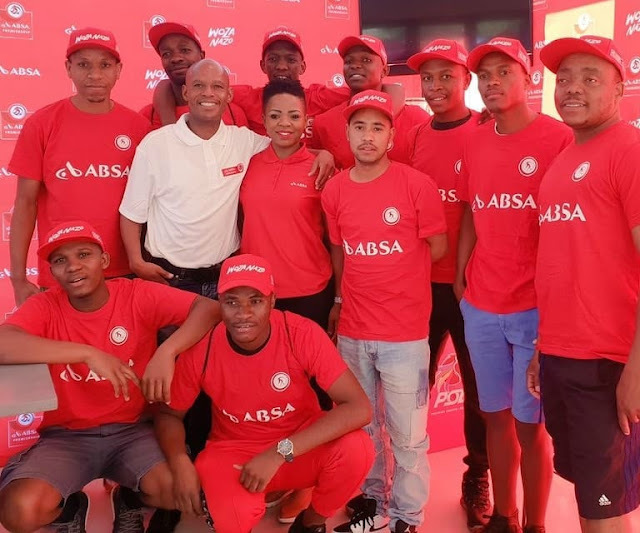 Absa introduced the Kick-For-A-Million as a way of celebrating the renewal of the Absa Premiership sponsorship with the Premier Soccer League (PSL) for a further three years. Woza Nazo, meaning ‘Bring it On’, is a competition which took place on each of the Woza Nazo matches to give local soccer fans an opportunity to kick for R1 million and to be awarded for their support and passion of the game. Over 7, 000 football fans entered the competition and R100 000 prize money was given to 60 regional winners. Only ten of them made it to the finals. Sadly, no woman made it through even though many of them tried. Jabu who had gone through a massive transformation had a lot to say about his journey with money. I remember how he was pride of the townships at the start of his career. Then stories started cropping up about his alcohol and drug abuse. I remember how media just sat on those negative stories and it seemed at the time that no one was coming to the soccer whiz side to help him out. At the event he took us down memory lane and how it all started. I loved the fact that he didn't hold back and was honest about his struggles and failures. He made sure that these ten young men, all under the age of 40, had something to takeaway from his message. When he started talking, we were all ears because we all remember his life as a brilliant soccer player and how he his life took a sharp turn for the worst. I honestly think we need a book from him. Jabu started drinking from a young age because the environment he was raised in allowed him too. His passion and talent for soccer couldn't make up for all his internal struggles. Even though he had a lot of support from his mom, she couldn't protect him from his own bad decisions. At one point in his career he had 5 cars and was renting. He tells us that he never once owned property during his high life. He also neglected his beloved mom. But Bobby Motaung forced him to rebuild and renovate his mother's house. His mom has since passed away. He admits that he squandered his wealth because of the bad choices he made. He and his wife had to move back to the townships, with their three kids and live with his mother in law. His so called friends disappeared and people were laughing at his in townships. He took taxis and he became a regular guy. After three years of introspection, staying sober and taking responsibility for his actions, he got back up again. He credits God and his wife for his comeback. He says without his wife's support, he would not have made it. She sticked it out with him through thick and thin. He also says he had to apologise to Supersport United after they gave him a chance earlier and he abused it. He also begged to give him another chance. And after a while they gave him a chance without a salary. It's only after eight months did they start trusting him enough to pay him for his hard work. Today, Jabu is the Supersport United Brand Ambassador, MDC Ambassador and Supersport Soccer Analyst. Money is confusing especially if you don't have direction and purpose for it. If you are making bad decisions, out of ten friends, only one will pull you aside to give you good advice. The rest don't care. His wife told him that losing his money was a blessing because if he continued on his journey of drugs and booze, he would have died. When you finally make that much money, keep your life simple. Don't try and compete with anyone. Stay grounded. Always be honest with yourself and pursue integrity. If you've messed up, you must learn to give people enough time to learn to trust you again. Don't let your friend change your mind about the important things that you need to do in your life. If you have planned to take of your mom, do it. Don't renegade on your best decisions. Don't try and do this life alone. And when it comes to your money always seek a professional. They know what to do. You can not plan for your money when you already have it. Understand the psychology of money and how that works for or against you. Learn to manage your money by starting with what you have now. We like rewarding ourselves more than we like being responsible. Balance is key. Understand your needs from your wants and learn to separate the two. Financial planning is all about the choices you make every single day with your money. If you are forced into retirement, what happens to you and your family? Have you set aside enough to help you and your family continue with the lifestyle you are accustomed to? What is is that you want to achieve with your money? Don't be afraid to talk to a professional. As parents you can't raise your kids the same way as you were raised. Change their today and you change their future. The final stage of the competition that will decide the winner and change their lives, will take place at halftime during the Absa Premiership trophy handover match between Bloemfontein Celtic and Mamelodi Sundowns at the Dr Molemela stadium on Saturday, 12 May. The match will kick off at 3pm whilst the final of the Kick for a Million competition will be take place at half time during a live broadcast on both SuperSport and SABC. All the best to the winner.